"Steve Hardstaff could be Liverpool’s original pop artist. A new book spanning more than 30 years of his work designing album sleeves and concert posters for everyone from Led Zeppelin to the Icicle Works is launched today. Cover Versions brings together a collection of classic album sleeves for the first time." Thanks Meg ! This will be on my must get list. not a big fan. isn't he jacuzzi? the electric magic poster was the best thing he has done. pass. I have a Led Zeppelin poster book by Roger Holland. I had another one but forgot the name of it. If I remember correctly the last page had a picture of Bonzo on it from 1977. I think it came out in 1988. 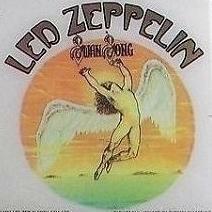 Does anyone know the book I'm referring to or perhaps can name some other Led Zeppelin poster books?